Pinsir in Pixel-land!? Pokemon One a Day! It's hip to be a square! Or rectangle! Or boxy shapes in general! 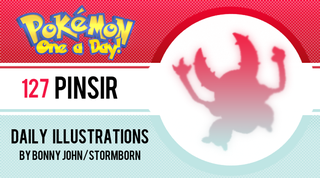 In today's Pokemon One a Day illustration, I feature Pinsir in a style that can sorta be described as an HD bump to a Pinsir that could've once been pixelated. So what do we call this? I look at it as something voxel like - Minecraft x Lego or something mini-fig inspired. Whatever the case may be, I knew that for the piece to be a success, every line needed to line up to make the shapes sit in real space. I needed the piece to look and feel clean and concise...And you know what that means. Wait, you don't know what that means!? After all this time you've spent with me!? It means that this otherwise simple looking piece took a long time to complete. Painting it on Photoshop, I'm sure there were plenty of quicker and easier ways to do it in other programs. I was thinking about trying to sculpt something like that or use another kind of program that builds these kinds of things for you, but it might've been too easy. I can look at this piece and say I painted that up in Photoshop, and it seems worth it after that thought! This is a piece where the aesthetic overtakes everything else - it's very standard. No action, nothing really dynamic...Just a Pinsir giving you the stink eye. It's a piece where you look over the decisions I made to create this specific form and try and understand why I did the things I did- such as removing the spikes from Pinsir's pincher claw/horns and making it smooth, or why the claws and talons/nails were all added as paint decals rather than actual elements. In terms of painting, the piece was flat but as usual, I thought that was boring and added a nice sense of lighting by illuminating the piece from behind. This makes the front very dark but the surrounding planes are basked in light which create a really nice feeling that makes the piece more rendered out than usual. The colors were a lot saturated earlier in the process but I decided to desaturate things as Pinsir in his original form is a dull grayish tone. I've seen varying representations in color so I chose something a bit more brighter and lighter in tone as a compromise. So yeah! Here's Pinsir on One a Day - what do you think? 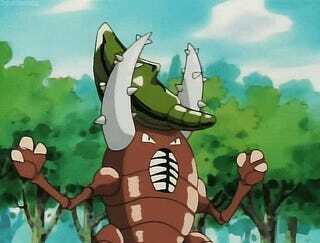 Is Pinsir going to hang out with his friend Steve in Minecraft? Or does he a have a future in the next Lego movie? Thanks as always for stopping by to check in on the next episode of Pokemon One a Day with me, Bonny John, as your host, artist, and narrator. See you tomorrow to wrap up the week! Good night!